(Bloomberg) -- An improving policy backdrop in the U.S. and signs of stabilization in Europe and Asia have prompted Bank of America to relax its defensive stance on the American equity market. Strategists led by Savita Subramanian raised consumer discretionary stocks to overweight from underweight, while cutting utilities to underweight from overweight. The 180-degree turn comes amid a dovish tilt by the Federal Reserve, progress toward a trade agreement and a reduced risk that President Donald Trump will be impeached after Robert Mueller’s investigation found no evidence of collusion with Russia. It’s a reversal of calls they made last year in a much different environment. The Fed had said its balance-sheet reduction was on autopilot. The S&P 500 Index was tumbling to the cusp of a bear market. Anxiety over a global growth slowdown was intensifying. And a deal with China seemed unlikely. 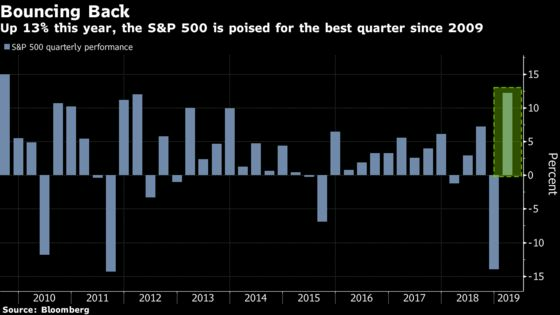 Utilities did better than any other industry group between the S&P 500’s record last September through its Dec. 24 low, making them relatively expensive compared with the broader market, the strategists wrote. They also cut health-care stocks to neutral from buy, citing concern about leverage being at a record high and uncertainty over drug pricing and next year’s presidential election. Bank of America’s more positive tilt is the latest sign of renewed optimism in the U.S. equity market. RBC Capital Markets’ Lori Calvasina and Credit Suisse’s Jonathan Golub raised their 2019 S&P 500 targets last week, citing an improving macro backdrop. Wells Fargo’s Chris Harvey, one of Wall Street’s biggest bears, is considering doing the same.